A darling v-neck relaxed tees from People Tree. in their fantastic organic cotton, and the most darling star print. Just easy fun all around, we. are happy to throw this on with the matching shorts or pants, but we know we'll throw it on solo with our favorite joggers! Washes great! Garments is a social enterprise in India. 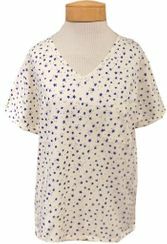 The skilled artisans at Assisi transform Fairtrade and organic cotton fibre into beautiful handmade garments.